In his annual counterterrorism speech on May 23, President Barack Obama again vowed to revamp efforts to close the detention center at the Guantánamo Bay naval base in Cuba (GTMO). The GTMO detention center, Obama stated, casts the United States as a nation that “flouts the rule of law” and costs $350 million USD per year to maintain. He also called for congress to lift the moratorium on the transfer of 56 detainees from GTMO to their homes in Yemen and facilitate other transfers to “third countries.”  While the Obama administration has revealed that 86 of the 166 prisoners at GTMO have been cleared for release or transfer to other prisons, political pressure from obstructionist conservatives in the United States has prevented any action from taking place, leaving these detainees in a state of prolonged limbo. Detainees staged a hunger strike this spring—to which the United States responded not by changing its policy, but by force-feeding the prisoners. The continued operation of the GTMO detention center is a shameful indictment of a backward and often hypocritical foreign policy, in which the United States legitimizes leaving Cuba on the State Sponsors of Terrorism List and simultaneously operates a morally objectionable detention center with a long history of human rights violations. While closing down the detention center and transferring detainees would be a step in the right direction for the Obama administration in terms of improving its poor human rights record, there is a larger issue at hand that has been ignored by both the administration and mainstream media outlets. In addition to being a detention center, Guantánamo Bay houses a naval base that represents the imperialist past of the United States in Cuba and the rest of Latin America; this base will remain operational even if Obama succeeds at closing the detention center. Ultimately, if Obama truly wanted to improve relations with Latin America, through a change of policy on Guantánamo, he would not only close the GTMO detention center, but also return the entire naval base to Cuba. While the GTMO detention center opened in 2002 as a response to the September 11, 2001 terrorist attacks and the U.S. war in Afghanistan, the Guantánamo Bay naval base has been under U.S. control since the signing of the Platt Amendment in 1901. The amendment gave the United States the right to intervene in Cuban affairs for the “preservation of Cuban independence” and legitimized the use of the Guantánamo Bay naval base by permitting the United States to buy or lease the land from Cuba. By taking advantage of a weak and powerless Cuban state just emerging from a difficult war and beguiling Cuba into complying with the treaties through an offer of trade subsidies, the Platt Amendment and the Cuban-American Treaty (1903) that followed were one-sided “agreements” that failed to take into account the needs of the Cuban population. The United States imposed the Platt Amendment on Cuba during the height of its imperialist strategy in order to “protect American commercial interests—especially investments in sugar—against Cuban labor radicalism.” Rather than preserving Cuban independence, the Platt Amendment and the open-ended lease of Guantánamo Bay to the United States served to fortify a U.S. military presence on the island, despite the protestations of an unwilling host. Since the 1959 Cuban Revolution, the Cuban government has repeatedly questioned the legality of the United States holding of Guantánamo Bay and unsuccessfully demanded that the base be closed and reverted to Cuba. The Guantánamo Public Memory Project calls the Guantánamo Bay naval base “a legal black hole” because of the controversial wording of the Platt Amendment. While the amendment granted Cuba “ultimate sovereignty” over Guantánamo, it simultaneously gave the United States “complete jurisdiction and control over the territory.” This wording resulted in a situation in which the United States fully dictated which laws applied to Guantánamo, and therefore, until the landmark ruling of Boumediene v. Bush in 2008, was able to legitimize its denial of constitutional rights to detainees. It also meant that the United States could decide when, if ever, it wants to return the base to Cuba—undercutting Cuba’s ability to exercise its ultimate sovereignty over the land. Since his 2007 presidential campaign, President Obama has maintained that he intends to close the GTMO detention center, but was only able to make small steps toward that goal during his first presidential term. When, in 2009, Obama signed executive orders to close the Guantánamo Bay detention center within a year, as well as to establish an interagency task force to review his administration’s detention policies and individual cases of Guantánamo detainees, it appeared that he might put the issue behind him. However, he quickly ran into trouble regarding how to try prisoners convicted for their participation in the September 11, 2001 terrorist attacks without inflaming U.S. public opinion. Furthermore, his initiative to transfer detainees to the Thomson Correctional Center in Illinois backfired in May 2010, when the House Armed Services Committee unanimously passed a defense measure that prohibited the creation of detention centers in the United States. Since his reelection in November 2012, Obama has re-engaged with the possibility of closing the Guantánamo Bay detention center—in part due to political pressure from liberals and human rights activists. A hunger strike by Guantánamo Bay detainees who have been held indefinitely at the detention center (despite many being cleared for release) came to a head in April this year, and is probably what prompted Obama to more forcefully address the issue in his counterterrorism speech. If Obama Closes the GTMO Detention Center, So What? 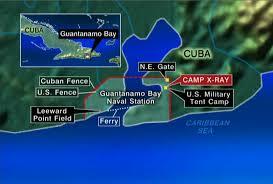 I do not think closure of the GTMO center would have any impact on bilateral relations with Cuba. If the entire base were shut down and handed back to Cuba, I think the Cuban government would react favorably and see it as a goodwill gesture. But that will not happen even though the actual base is an unnecessary expense and serves no more of a strategic purpose than the detention center. For Obama, closing the Guantánamo Bay detention center has more to do with improving the image of the United States in the world than it does with improving U.S. relations with Cuba or other Latin American countries and the Caribbean. As Obama decried in his May 23 speech, the Guantánamo Bay detention center is an unnecessary moral and financial burden on the United States. But the naval base itself, which Obama has never suggested closing, still serves a strategic purpose of projecting U.S. military power in the Western Hemisphere. Washington’s cursory discourse concerning Guantánamo Bay—which neglects to consider reverting the naval base to Cuba as an option—suggests that its imperialist inclinations have not fully abated. 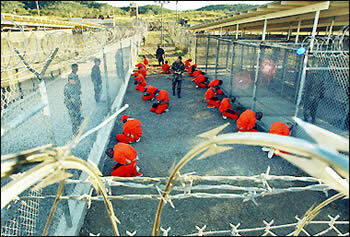 Guantánamo is a symbol of the imperialistic past [of the United States] towards Latin America, and in particular Cuba. The detention center should be shut down, those not charged freed immediately, and the rest, if any are truly guilty, sent to the United States. The bigger situation is that the base itself, forced upon Cuba more than 100 years ago, should be returned to Cuba. [U.S. citizens] have no right to be there, except under a one-sided treaty that the Cuban government has long condemned. That would certainly improve relations between the two countries, but the Americans have made it clear they have no intention of returning what rightfully belongs to Cuba. 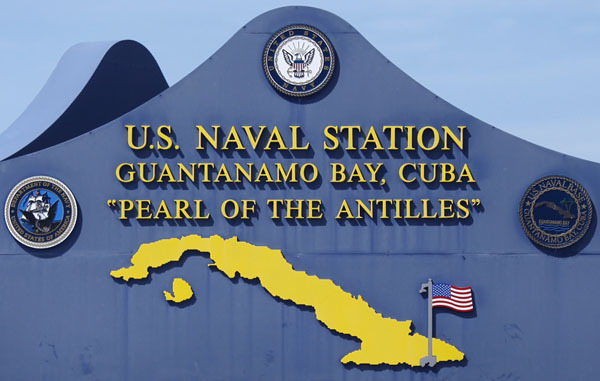 Obama’s failure to address the imperial history of the Guantánamo Bay naval base or respond to (let alone acknowledge) the Cuban government’s pleas for the naval base to be returned to Cuba are symbolic of Washington’s unflinching Latin America policy. Even as it shows faint signs of winding down its global war on terror—as evidenced in Obama’s speech—Washington’s maintenance of the naval base in Guantánamo remains an obstacle to developing a policy of mutual respect in U.S.-Latin American relations. NPR, “Transcript: Obama Addresses Counterterrorism, Drones.” May 23, 2013. http://www.npr.org/2013/05/23/186305171/transcript-obama-addresses-counterterrorism-drones. Internet Modern History Sourcebook, “Transcript of Platt Amendment.” http://www.ourdocuments.gov/doc.php?flash=true&doc=55&page=transcript. Guantanamo Public Memory Project, “GTMO’s Legal Black Hole.” http://gitmomemory.org/timeline/guantanamos-legal-black-hole/. Strauss, Michael. “The Creation and Evolution of the Legal Black Hole at Guantanamo Bay.” http://www.ascecuba.org/publications/proceedings/volume20/pdfs/strauss.pdf. Crowley, Michael. Time, “Can Obama End the War on Terror?.” Last modified May 24, 2013. http://swampland.time.com/2013/05/24/can-obama-end-the-war-on-terror/.